Well….okay, they are actually doing the exact opposite of that. 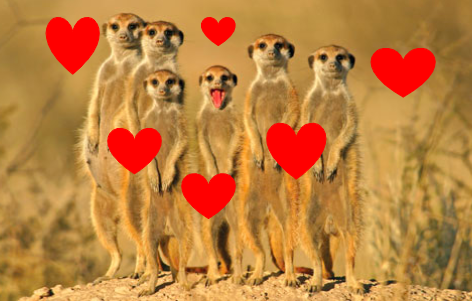 The El Paso Zoo will name a cockroach after your ex and feed it to a Meerkat LIVE on Valentine’s Day! What better way to say “I miss you” than with the sweet, sweet gift of having your name-sake devoured by the wildlife that made competitive eating cool long before Kobayashi and Joey Chestnut! Beginning Monday February 11th, you can message the El Paso Zoo on their Facebook page with your ex’s name (first name and last initial only). Then on Valentine’s Day (February 14th), you can watch Live on the Zoo’s website or Facebook page as the cockroach is devoured by a meerkat during the “Quit Bugging Me” event. The names of the ex’s will also be on display around the meerkat exhibit and on their social media pages starting February 11th. I am really curious to see how many of my ex’s take part in this event! No word yet if there will be any awards for the name seen most often. For anyone that has never checked out the El Paso Zoo’s website, the Live Animal Cams can be a lot of fun! I think this is a fun and creative way for the zoo to gain some free publicity. What do you think? Would you like to see your ex get eaten live on Valentine’s Day? If you would rather get a gift for someone you still care about, you can check out of Valentine’s Day gift ideas for Him and HER as well. Previous Fan Theory Friday: Is Marvel’s Hawkeye A Skrull? This is awesome! Way to make the holiday fun for everybody. This is a hilarious idea! I am not sure that I would want to put all of exes crap on an innocent (albeit, disgusting) cockroach… but I could see how it would be therapeutic!